Tagori-hime, Tagitsu- hime and Ochikishima- hime. 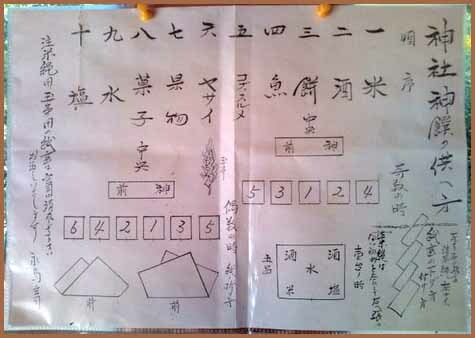 it is commonly used to refer to Hetsu-gū alone. 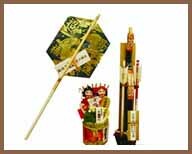 As documented in Japan's second oldest book, Nihon Shoki, the shrines are devoted to the three Munakata goddesses. 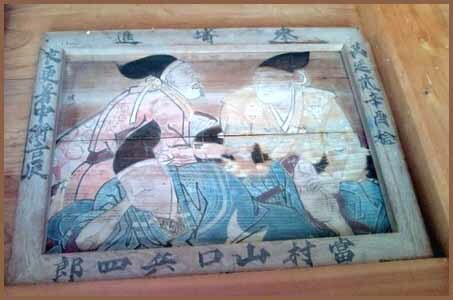 These kami are believed to be daughters of the god Amaterasu, the ancestor of the imperial family. 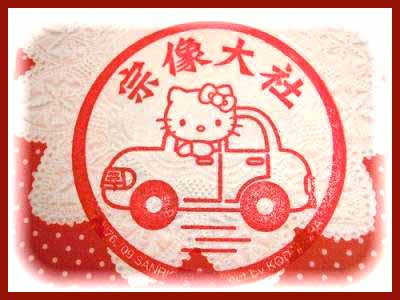 Susanoo has also been worshipped there for many years as the god of mariners, and he has come to be worshipped as the god of traffic safety on land as well. Munakata Taisha is also home to many Japanese treasures. 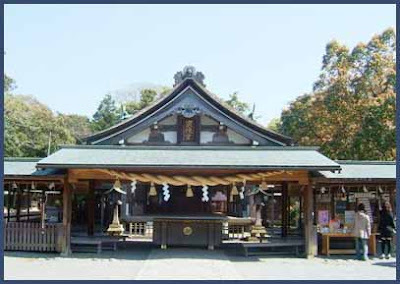 Hetsu-gū's honden (main shrine) and haiden (main prayer hall) are both designated Important Cultural Properties. The Shinpō-kan (神寶館), the shrine's treasure hall located on the southwest corner of Hetsu-gū's grounds, houses many important relics including six National Treasures of Japan. Over 120,000 artifacts housed in the Shinpō-kan were unearthed on Okinoshima. All three shrines are located in Fukuoka Prefecture, yet they are all on separate islands. The main shrine, Hetsu-gū, is located on the mainland of Kyūshū. Nakatsu-gū is established at the foot of Mt. Mitake on the island of Ōshima off the west coast of Kyūshū. The final shrine, Okitsu-gū, is on the island of Okinoshima located in the middle of the Genkai Sea. The shrine occupies the entire island, therefore women are not allowed to set foot on the island and men must perform a purification ceremony before landing. Munakata Shrines 宗像 and Munakata Taisha 宗像大社. Munakata Taisha in Munakata City (Fukuoka) is the mother shrine for some 6,000 satellite Munakata shrines nationwide. 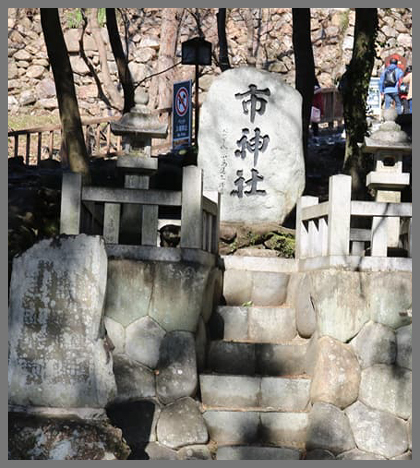 Munakata shrines are dedicated to the Munakata Sannyoshin 宗像三女神 (also written 胸形三女神), the "Three Female Kami of Munakata." These three are water goddesses, island kami, and patrons of safety at sea, bountiful fishing, guarding the nation, and protecting the imperial household. The trio appear in the Kojiki 古事記 (K) and Nihon Shoki 日本書紀 (NS), two of Japan's earliest official records of the 8th century, although the spelling of their names differ slightly. Their worship began under the patronage of the Munakata 宗像 clan on Kyūshū (Kyushu) island, hence they are named the Three Goddesses of Munakata. 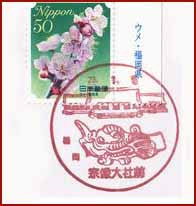 In the 8th and 9th centuries, Japanese envoys to Korea and China visited Munakata Taisha before their departure to pray for safety on the sea voyage (in the Nihongi, the supreme sun goddess Amaterasu commands them to protect the sea route from northern Kyushu to the Korean Peninsula). In the classical texts mentioned above, all three kami were formed when sun goddess Amaterasu broke Susanō's sword, chewed it in her mouth, then blew out a mist that produced the triad.
. Isaniwa Jinja 伊佐爾波神社 Matsuyama . One of three female kami produced as a result of the trial by pledge (ukei) between Amaterasu and Susanoo. The three became known as the "three goddesses of Munakata" as a result of their enshrinement and worship at the shrine Munakata Taisha by the Munakata clan, and are thus believed to have been sea deities or tutelaries of travel on the Genkai Sea. daughter of Amaterasu and officially celebrated at the Itsukushima shrine in Miyajima, Hiroshima. The shrine overlooks the Genkai Nada 玄界灘 open sea off Kyushu. People pray here for safety at sea, but also for progress in the arts and good business (kooyoo no kami 交易の神). Munakata Taisha is also called "Michinushi no Muchi" . Muchi is noble honorific for god. 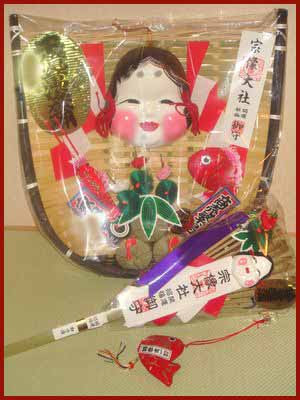 Nihon-shoki describes the Munakata Daijin as the best way of god. have them hold ye in reverence." One of the three female kami produced as a result of the trial by pledge (ukei) between Amaterasu and Susanoo, Ichikishimahime is enshrined at the Hetsugū, one of three shrines at the Munakata Taisha in the old province of Chikuzen (present-day Fukuoka). She is believed to have originally been a sea tutelary protecting the sea lanes in the Genkai Sea, and is later known as one of the kami enshrined at Itsukushima Jinja (Hiroshima Prefecture), where she may have been brought after the Engishiki period and enshrined as central object of worship. 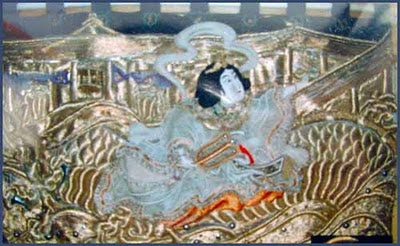 At Itsukushima, Ichikishimahime was also the object of combinatory currents in the medieval period, and came to be identified variously with the daughter of the Indian dragon king Sagara or a younger sister of Empress Jingū, while alternately receiving worship as the Indian goddess Benzaiten. See also Tagorihime. The faith has elements of guarding the nation and protecting the imperial house, as well as safety at sea and ensuring fishermen a bountiful catch. 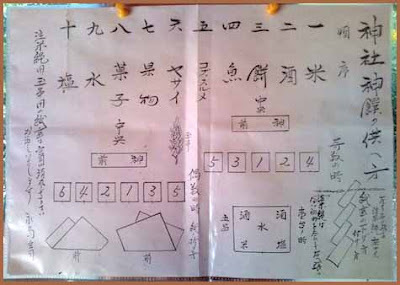 Munakata can also be written with the characters 胸形 or 宗形. The Jinmyōchō section of the Engishiki records that there were Munakata shrines stretching from northern Kyushu to the Kantō area. Among these, Munakata Taisha located in Fukuoka Prefecture is the most famous. The shrine's enshrined kami's (saijin) are the "Three Female Kami of Munakata" (Munakata Sanjoshin), Ichikishimahime no kami enshrined at Hetsumiya in Genkaimachi Tashima, Munakatagun, Tagitsuhime no kami, enshrined at Nakatsumiya on the island Ōshima, located roughly ten kilometers from land, and Tagorihime no kami, enshrined at Okitsumiya on the island of Okinoshima in the center of the Genkainada sea. That the Munakata Sanjoshin are worshipped individually at a different location is recorded at an early date in such documents as the Kojiki and the Nihonshoki, but there are variant characters for the kami's names and different locations for their enshrinement. At the approximately six thousand Munakata shrines in Japan, the respective "enshrined kamis" (saijin) worshipped vary according to each shrine's origin legend. The Sanjoshin are said to have been born on the occasion of the "divination trial" or "contract" (ukehi) between Amaterasu and Susanoo. The original meaning of the names of each kami derives from "female mediums" (miko) (Ichikishimahime), rough water (Tagitsuhime), and fog (Tagorihime), and the Sanjoshin are deifications of miko, rough water, and fog. In the Nihonshoki Amaterasu ōkami commands that the three kami of Munakata "descend to the middle of the route (the sea route from Northern Kyushu to the Korean Peninsula), assist the heavenly grandchild (tenson – i.e. Ninigi no mikoto) and allow yourselves to be worshipped by the heavenly grandchild." The kami was also prayed to for safe sea travel by emissaries along northern routes, such as the early envoys to China (kentōshi) and demonstrated wondrous efficacy at the time of Empress Jingū's military expedition to the Korean peninsula. The kami developed into a guardian of the nation and protector of the imperial house, as well as a protector of sea travelers, and enjoyed the fervent faith of people from all walks of life. The Munakata clan officiated at the festival of the Sanjoshin. 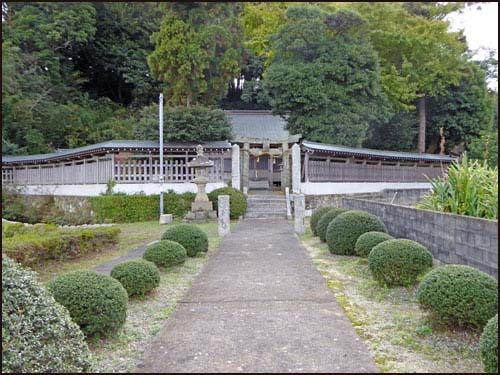 Along with the new system of land governance instituted during the Taika Reforms, the county Munakatagun was designated a "shrine tribute land" (shingun) and the Munakata clan simultaneously occupied the post of governor (tairyō or kōri no miyatsuko) of that county. The Munakata clan not only had close ties to the imperial house, but established marriage connections with powerful people on the continent. Even after the Japanese government stopped sending envoys (kentōshi) to China, the clans trade with the continent continued and they were powerful with regard to rights of sea travel and trade. Today only shrine priests (shinshoku) reside on the island of Okinoshima, which has a circumference of approximately four kilometers. The island has a tremendous "altar constructed from stones" (iwasaka) which was the subject of a fieldwork study from 1954-1972. Research revealed the remains of ceremonies and objects in the crevices of the rocks dating back to between the fourth and ninth centuries, elucidating the development of early Shinto rituals and how people worshipped. The more than 100,000 ceremonial objects discovered originate not only in Japan, but also include objects from the Korean peninsula, China, and even Persia. 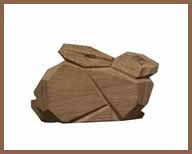 Many have been designated National Treasures or Important Cultural Properties. There is a taboo against speaking about Okinoshima and against removing any objects from of the island.
. Funadama 船霊 guardian deity of a boat .
. Kakinomoto Hitomaro 柿本人麻呂 Hitomaru 人丸 / 人麿 . .
. Itsukushima Shrine 厳島神社 Itsukushima Jinja . 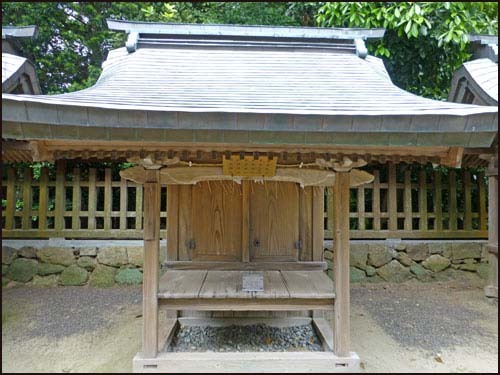 Munakata Taisha blesses all the good human behavior and is considered a most precious god by people. 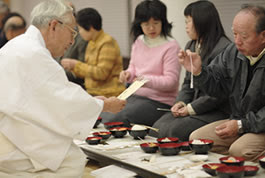 For the ceremony,which dates back more than 800 years, special food offerings are made, consisting of rice, sake, salt and water, gebasa seaweed ゲバサ藻, soy beans, and miso paste blended into a kind of salad (aemono). Kunenbo mikans 九年母 and a special kind of hishimochi ricecakes 菱餅 are also offered. After the ritual offering, the food is eaten by the participants to honor the deity, pray for a long life and give thanks for her bountiful protection. Admission for this ceremonial feast is 1000 yen. 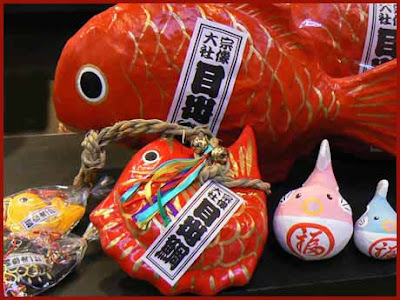 Celebrated in many towns of Japan, but especially at Munakata Shrine in Kyoto at the first market day, usually around January 10. People take part to ward off evil in the coming year.
. New Year Markets .
. Amenominakanushi no kami 天之御中主神 .
. Antoku Tenno 安徳天皇 . “Revere gods and love people” was the motto of Sazo Idemitsu (1885-1981), the founder of Idemitsu Kosan Co., Ltd., and he literally followed it his entire life. In 1942, Idemitsu, a native of the Munakata area of Fukuoka Prefecture, led the Munakata Shrine Fukko Kiseikai (Restoration Committee) and was instrumental in restoring the grand shrine’s buildings, which were by that point in a derelict state. So much work was involved that it was not until 1971 that it was ready to revive the tradition of receiving worshippers. Now the Idemitsu Museum of Arts in Tokyo is holding an exhibition of 106 artifacts from the Munakata Grand Shrine, including many national treasures, alongside others excavated on the island of Okinoshima. The exhibition is the legacy of Idemitsu, who devoted his life to restoring the shrine prominence.